Listening to the Shabad within is the Surt-Shabad technique of Guru Nanak Devji enumerated in Shree Guru Granth Sahebji . Shabad in Guru roop is ever with the Sikhs . they only have to keep their surt (conscious awareness) within and listen to the Anhad Shabad . The intuitive guidance of the Shabad Guru is always available to them as HE is ever present. The sehsa (doubt) a sikh has to remove during Simran efforts is that Waheguruji HIMSELF are shabad swaroop in SGGSji and as Shabad Guru are ever accessible within. Waheguruji is all around in the creation and are the substance of creation as well. HE is player on bothsides. We as jyote swaroop have to go across our ego to be one with HIM. More has been written on this topic in the eBook titled “Anhad Shabad :the celestial sound within” in pdf form ,which is available for download at the ebook links space on this blog page. how to listen this shabad??? - Sit in a quite place.Relax your body , close the eyes and shift awareness within. - Keep your focus of attention inside your head at a spot which is near top of mouth cavity and behind the eyes. This spot gets choosen intutively. - Listen for the sound and it would definitly be heard. hello please tell me who is the bhai sahib who sings Jap Man Mere Govind Ki Bani shabad that you posted there, and how i can find more shabads from that bhai sahib. How to hear the anhad shabad? Is it only through reciting 5 shabads of radha soamis, or can gursikhs do it too? Does it have to be during amrit vela? The shabad 'Jap Man Mere Govind Ki Bani ' has been sung by Bhai Saheb Apardeep Singh ji. You can download more of his Shabads from AKJ site . Hearing of Anhad Shabad is very much possible by a GurSikh.In fact The path of Sikhee leads to it and further beyond.The Sikh's Guru Is Shree Guru Granth Sahebji - a Shabad Guru. The Sikhs Guru within him/her is the Shabad which is coming from IkOankar.Even Guru Nanak Devji revealed in 'Sidh Ghosht" that his Guru is Shabad. Guru Sahebji were one with the Shabad- Parbraham Roop. The path starts with Simran,awareness of oneness- a very very small glimpse of IkOankar , feeling of Hazuri. There is a whole Bani - 'anand " in SGGSji refering to Anhad Shabad and many other references.For this one has to first commit to acceptance of SGGSji as Guru and follow the gurbani's guidance. Does one have to focus on the location you have suggested in an earlier comment in order to hear the Shabad? What about focusing on the heart or navel areas? To hear the Shabad we have to focus inwards behind the eyes where the breath strikes. When we do simran and hear it then the awareness is pulled within at this spot. The naval and heart areas may not give the desired experience.The celestial sound is heard with awareness focused within . I’ve been hearing this for many years and have found little information on it. It prompted me to research binaural beat technology and to identify the frequencies. What I have found is that each frequency carries a positive emotion or state of mind: comfort, cheer, alertness, concentration and general wellbeing (bliss). I’ve come across the words ‘naad, ‘unstruck melody’, ‘primal sounds’, ‘unstruck celestial music’ in the SGGS and yesterday the words “Panch Shabad” and decided to do another search. It brought me here. 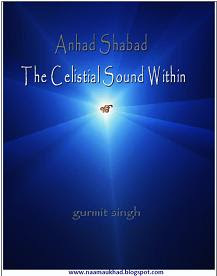 Thank you for writing “Anhad Shabad - The Celestial Sound Within”, Gurmit Singh Ji. I am grateful that I can finally identify what it is. I am impressed with the length and clarity of your blog but more so with the pyar with which you have written the blog and the further comments. God Bless! 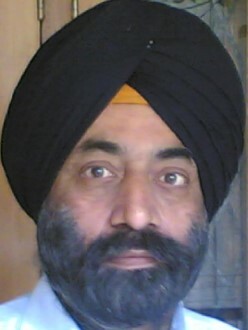 Dear Gurmit Singh ji, i have been practicing listening to the Shabad (sound within) for more than 3 months everyday for about 15 minutes or more but have not been able to hear it. Does it take longer time than that? Hearing of the Shabad is just HIS grace. SHABAD GURU when does kirpa it happens. No specific time limit. The Simran pulls the awareness inward. Place the surt at a point behind the eyes , just above top of mouth cavity. It is not a physical point. The minds thought flow does not matter, just keep coming back towards a quite state of being. The emotions cloud the mind. Quite the emotions. Faith means knowing that Shabad Guru is very much there and so is the Sound. The faith then becomes the truth. Faith has to be based on Gurbani words. The doors then begin to open. Quite often questions are asked in anonymous mode in a very crisp way. No back ground or details are given. Then with no other option the reply is intuitive. It would have been better if email had been sent withj details as some gursikhs do . Answers to spiritual questions are Guru guided and a share. In the process of spiritual progress we transform our self. It is not a question of just a change. but is a transformation. A life that is to be lived at a different level and meaning. The world view is changed from materialistic view to seeing and feeling a living pulsating presence of The MOOL - our origin.The boundaries then appear different. The Shabad is in all creation. The Hidden then begins to appear in perception. Gurbani is the way. We have to know How? Gurbani words repeated change our thoughts and perception. Gurbani words bring forth the higher state of mind - where feelings and perception is different. The Gurbani words are trans formative.All this is simran. The hearing of shabad is a natural corollary that is automatically there when all else is right. Just be patient and follow gurbani words. Read slowly. Let these vibrate in the mind. Look for proper meaning, it would come intuitive guidance. Guidance of Shabad Guru is always there.